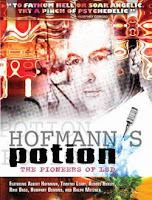 In 2002 Concepta Film finished a film called "Hofmann's Potion: The Early Years of LSD". Written and directed by Connie Littlefield and Produced by Kent Martin for the National Film Board of Canada. The documentary delves into the little known early history of the world's most notorious psychedelic. Long before Timothy Leary urged a generation to "turn on, tune in and drop out," lysergic acid diethylamide, or LSD, was being used by researchers trying to understand the human mind. This documentary is a fascinating look at the story of "acid" before it hit the streets. Featuring interviews with many LSD pioneers, Hofmann's Potion is much more than a simple chronicle of the drug's early days. With thoughtful interviews, beautiful music and stunning cinematography, it is an invitation to look at LSD, and our world, with a more open, compassionate mind. This is amazing. and so informative. I was always leery of acid, but this made me comfortable enough to try it. and it was perfect.